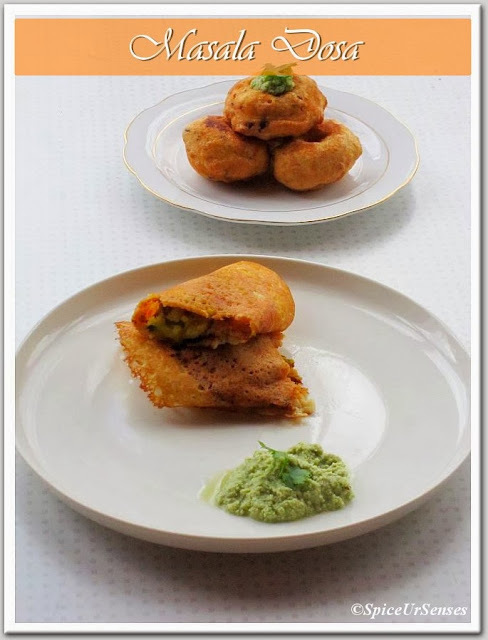 Masala Dosa.. From past few weeks I was craving for Masala Dosa and Medu Vada very badly. 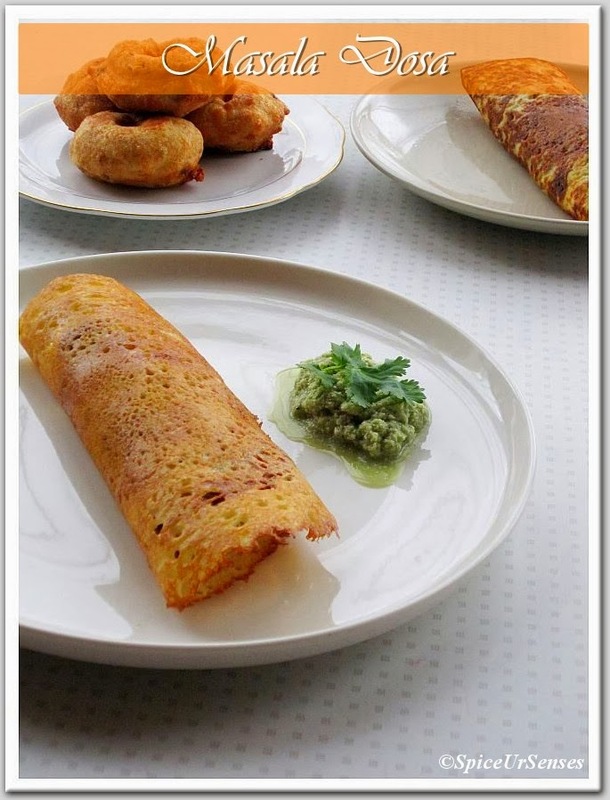 I was not at all getting sleep in the night because I use to get dreams of Masala Dosa. Was feeling very lazy to go out and eat. For me it is bit difficult to eat all this stuff out side, because they use lot of oil and it becomes taste less when you tell them to cook oil-less, for that reason only I was stopping myself to eat out. Though my hubby kept telling me lets go and eat out.. Cooking Method For Red Chutney. Dry roast all the red chutney ingredients (except the lemon juice and salt) then grind them into fine paste by adding lemon juice, salt and water. and set it aside. Cooking Method For Potato Paliya. Add mashed Potatoes, Salt, Coriander and mix it together gently. Switch off the flame and allow it cool. Cooking Method For Masala Dosa. Wash the urad dal, raw rice and methi seeds. Soak in a little water along with the poha and cooked rice for at least 3 to 4 hours. Grind to a smooth paste with a little water. Cover and keep aside for at least 4 hours. Add salt and mix well. Heat a non-stick tava and grease lightly with oil. 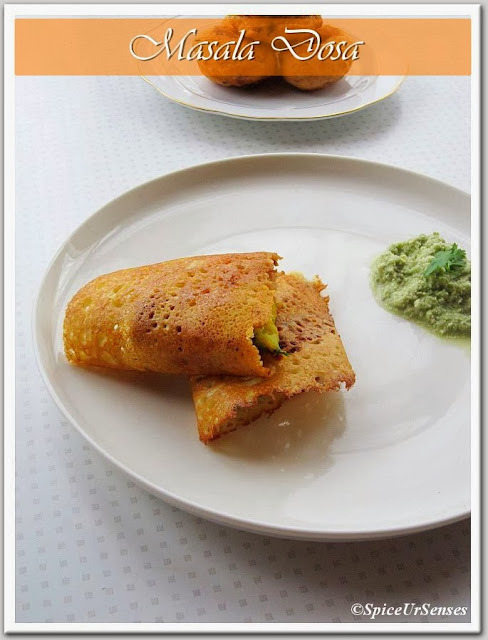 when hot, sprinkle a little water, pour a ladle of batter, spread it around, into a thin crepe , then apply the red chutney and keep the potato paliya into one corner of dosa and cook. Pour a little oil along the edges while cooking. When crispy, fold and serve hot with Sambar and Chutney. 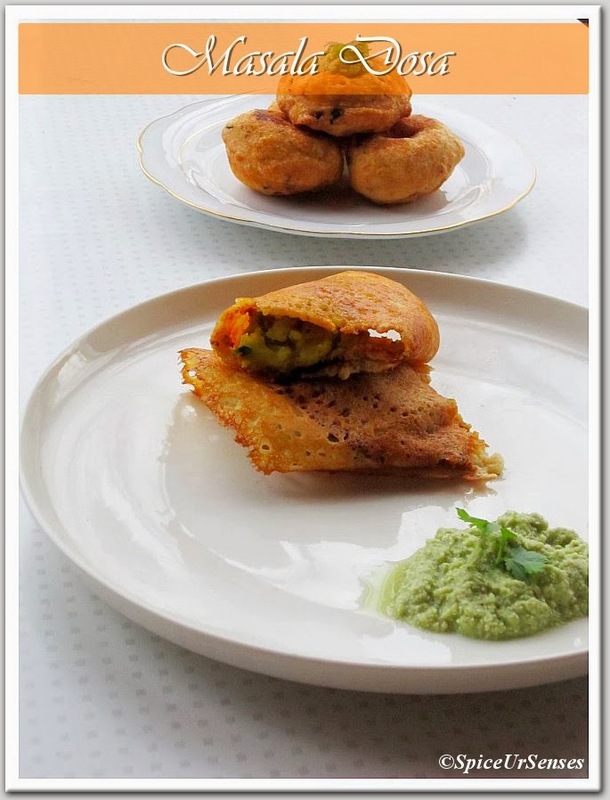 Very tempting dosa.. Love your presentation.. My all time favourite.. This is the one which I order most often when I go to Indian restaurant. Looks super crispy and yumm. 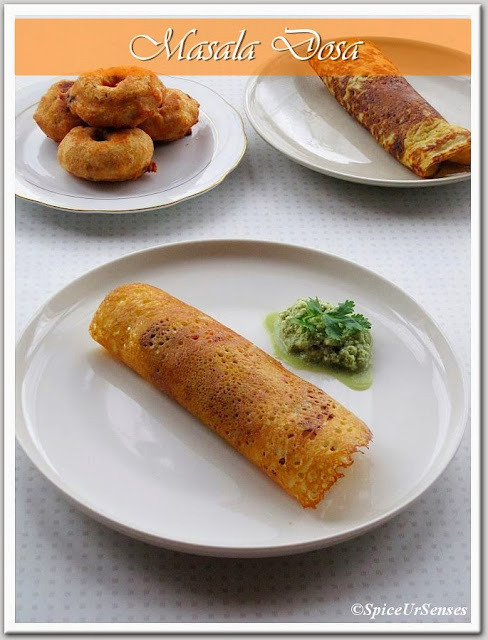 you guys make such perfect masala dosas and am yet to get a perfect round crisp ones. Vada and masala dosas, am inviting myself to ur place.. Inviting foods. masala dosa looks really delicious and tempting. Both are my fav. Beautiful clicl. Masoor dal is such an ideal dal for the fall season. Your buttered up version makes it sound even more delicious. well done!